Roland's pro edition of its smartphone audio mixer, the GO:Mixer Pro, is now down to $99 at Amazon. This is a saving of $70.99 off one of the handiest mini-mixers we've seen. 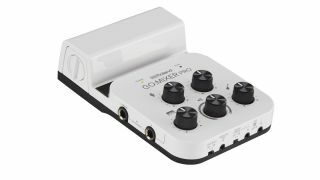 Despite its small size, the GO:Mixer Pro audio interface enables you to connect up to nine audio sources, including powered mics, guitar/bass and line-level instruments. You can adjust their relative levels and then send a stereo digital audio output to your phone so that it can be recorded into a video or audio app. The GO:Mixer Pro can get its power from batteries or the smartphone itself. You can monitor your mix using the headphones output. This comes with its own level control and also enables you to listen to backing audio from your phone while you’re performing. You can even route this audio to an app (along with the live input audio) via a Loop Back panel switch. A Center Cancel function, meanwhile, lets you create karaoke-style tracks on the fly.